November 23, 2016–Today was the first hearing in a military trial against Issa Amro, a Palestinian human rights defender facing a laundry list of charges relating to his nonviolent activism. Issa Amro, who has been recognized as a human rights defender by the European Union and the United Nations, has been arrested over a hundred times in the context of his ongoing activism in the past. Earlier this year, a closed military zone was established to control the area around his house in occupied Hebron. His home is also the site of the Youth Against Settlements center, a group dedicated to nonviolent resistance to Israel’s military occupation that organizes demonstrations and documents settler violence against Palestinians. Following international grassroots pressure from a number of organizations including Jewish Voice for Peace, representatives from the embassies and consulates of the United States, United Kingdom, Belgium, Finland, Germany, Spain, Sweden, and Switzerland, as well as representatives from the UN High Commissioner on Human Rights (OHCHR) office and of a number of international non-governmental organizations including Human Rights Watch attended the trial. Ahead of the trial, Amnesty International released a statement calling on Israel to drop the charges against Issa Amro, which they charge target the “peaceful exercise of his rights to freedom of expression and assembly.” Jewish Voice for Peace’s petition asking Secretary of State John Kerry to speak out on Issa’s case has nearly 12,000 signatures and a twitter storm in support of Issa ahead of the trial reached 1.8 million people. 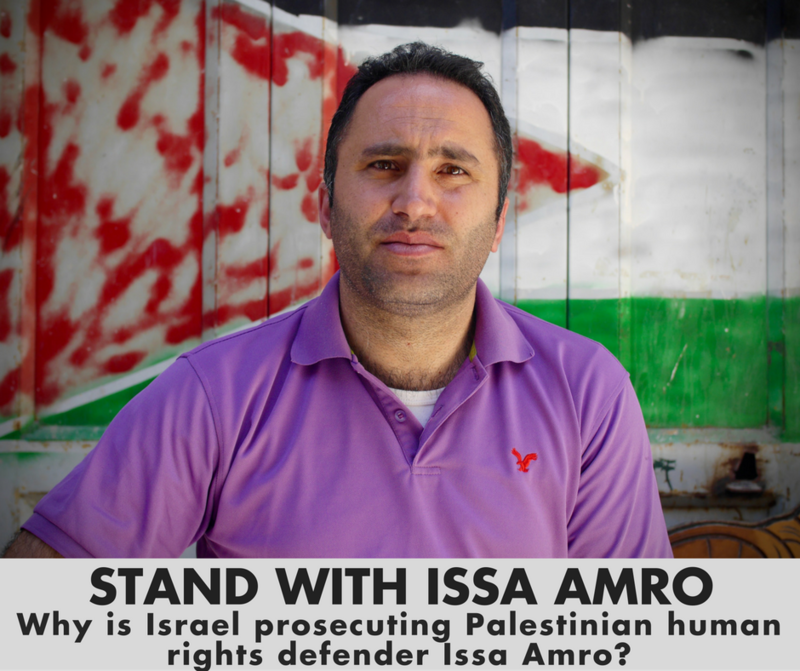 Issa Amro is facing 18 charges, all of which stem from old incidents and exaggerated accusations from “participating in an illegal demonstration” to “entering a restricted area” to “resisting arrest” and “obstructing a soldier.” Issa’s case is an example of widespread targeting of human rights activists in a military court system whose conviction rate for Palestinians is over 99%. Issa is a friend to many at Jewish Voice for Peace, and we are proud to support him and the inspirational nonviolent resistance work of Youth Against Settlements alongside many international partners. You can learn more about Issa’s work and his case here and listen to an interview with him on NPR earlier this year.